As the name suggests family or umbrella branding uses one of the family names belonging to the firm. Examples of family branding are Kelloggs Cereals and Heinz Foods. The advantage to family branding is that the new product benefits from the good will and equity built up by the family and umbrella brand. It also allows the organisation to consolidate marketing so that it promotes the family brand rather than each individual product. The disadvantage to umbrella branding is that any negative publicity generated by the new product could affect the other products using the family brand, so the firm must ensure that the same quality standards apply to each product using the family brand. 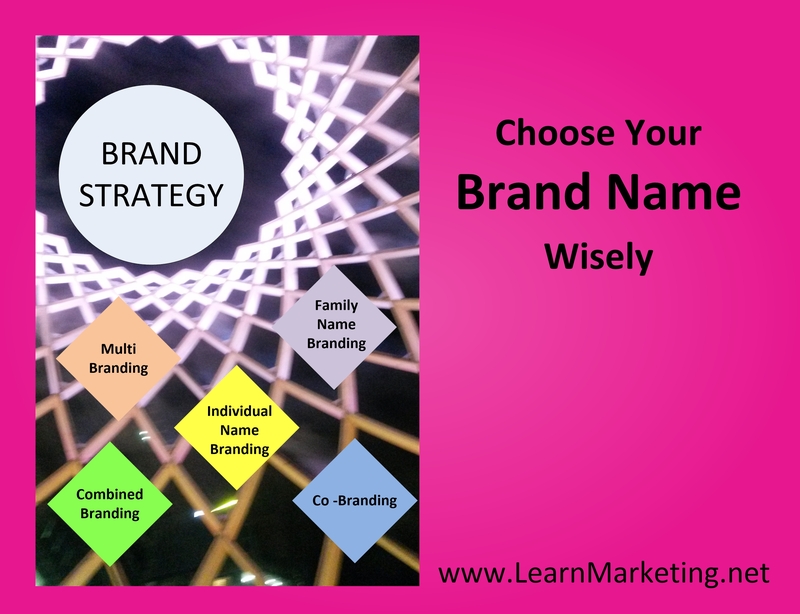 A popular strategy involves the organisation combing the already established family name with an individual brand name. The idea is to use the reputation of the established family or company name to launch a new associated product. The product manufacturer would like to highlight the fact that the product is recommended by another company e.g. Water softener Calgon is recommended by AEG, Bosch, Electrolux, Siemens, Whirlpool, Zanussi. The product manufacturer would like to highlight the components (which are produced by other companies ) used in the product e.g. bicycle manufacturers using brakes and gears carrying Shimano branding, suspension forks carrying labelled with the Suntour name. Product manufacturers believe that if they highlight quality or popular product parts used in their product it will promote sales. which an external organisation is happy to associate with their product. Co-Branding should also increase brand awareness as it increases the number of occasions that the consumer comes into contact with the product. Branding is a very important decision as it represents the firm producing it. Branding needs to make the product stand out from competitor products and persuade the customer to purchase it. The firm has a number of branding options they can link it with the corporate brand and similar products or give products their own unique branding. The ideal marketing strategy will depend on the success of the existing brands and customer loyalty. If existing brands are successful, family branding could help to launch new products. If the product type has low customer loyalty, firms will give the product its own branding and use other elements of the marketing mix to promote product sales.